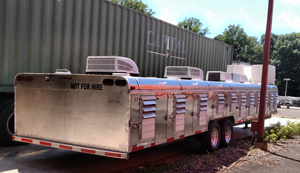 NGAP recently purchased what is unquestionably the best trailer rig in the US for all greyhounds. 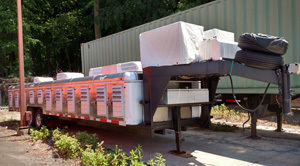 It was done not so much out of an immediate need since we already have a trailer, but because there may come a time when tracks begin closing from Florida and there will certainly be a need for good, safe transportation of greyhounds to move outside of that state. 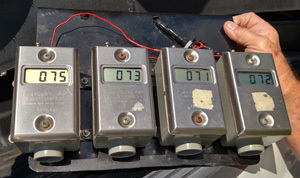 Below are photographs, two different views as well as pictures of the digital thermometers used to monitor the inside temperatures.